Shell Hill Cottages, Saltcotes, Lytham. Tracing Lytham's history back to the salt mines! A fascinating insight into part of Lytham's lesser known “salty” past has been brought to light by a local historian. Retired County Fire Brigade Officer, Mr Roy Singleton of Myra Road, Lytham, has delved into the record books to discover a long-lost and forgotten local industry - "salt-making. Born and bred on the Fylde Coast Roy, aged 71, first became alerted to Lytham’s links with salt when secretary of the Lions Club Housing Association. 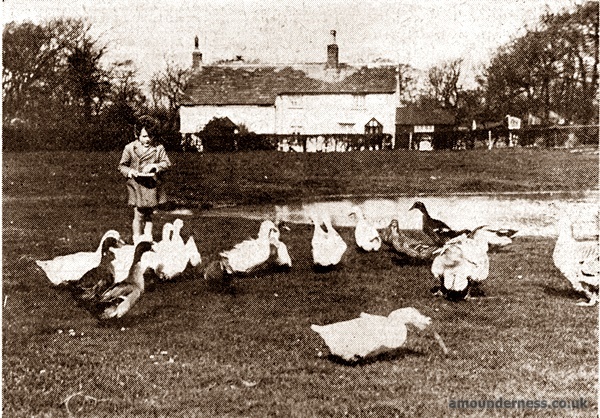 With an allotment on Mythop Road and a growing interest in the surrounding land, Roy wondered why the area was called Saltcotes. Then began weeks of research, gleaning snippets of information from local folk and the county records office in Preston as well as learning the art of early salt making from Hampshire County Council. Salt in the Middle Ages was a vital ingredient of everyday life, needed most importantly to preserve meat when fresh supplies were not available. Being in short supply, each area had to provide its own salt until Cheshire salt was discovered in the 17th century. The first hint of a salt-making industry in Lytham comes during the reign of King John when in 1201 he gave permission for the foundation of Lytham priory, naming one of the boundaries “Suartesalte” - suarte being a corruption of the old English word sweart meaning “dark in colour". 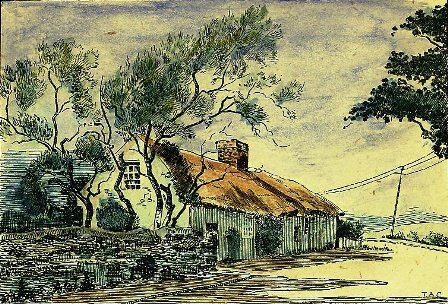 Records are also in existance of a small building for the refining of salt “at a place called Saltcotes near the Lytham pool” in the 1780’s. Delving still deeper Roy unearthed an account of producing “salt from sea water in Amounderness" 1. - the Fylde Coast’s ancient name. Men known as “wellers” dropped sand into wooden troughs, perforated with holes and lined with peat and straw. Sea water, already partly evaporated, was then poured over the sand and the sieved brine would then drip into barrels. The used sand was then cast onto a mound known as a “saltcoat hill”. The salt-makers cottages called, not surprisingly, “salt houses” usually held up up four boiling pans where the salt was extracted from the brine. The fuel used to heat the pans was peat - once plentiful in the Lytham area. After the scum was removed from the final wet salt, the solids were put into a wicker basket to dry. The drips from the baskets were usually thrown away but their richness in magnesium was appreciated in some area and in Hampshire became “Epsom Salts". As for the men themselves who toiled at the Lytham saltcoats, records belonging to the Clifton family mention payments in the early 1500s “to John Crokan of Lethm for salt" and "to John Fysher at Lethom for salt." Men who paid rent at Saltcotes in 1589 were John Saltus, (later changed to Salthouse), John Crookhall, and William Waltche. These three families were still paying rent in 1662, eight years before the discovery of Cheshire salt spelt the decline of sea salt making on the Fylde. But although no surface clues remain as to the location of Lytham’s ancient saltworks, Roy has used 18th and 19th century maps to place it either side of Liggard Brook near Lorne Street. “The Coat Hill and Nearer Coat .Hill fields together with the Coat Hill Pasture were on the edge of the marsh leading to the sandbanks,” said Roy. “It must be significant that the largest bank is still called Salter‘s bank to this day”. The records also show John Salthouse as a “smith” - probably the occupant of Saltcotes blacksmith which stood on the site now occupied by Mythop Road garden centre. "Saltcotes" is sometimes spelled as "Saltcoats" or "Saltcoates". Marriages. Lately, Mr. John Moon, of Greenhalgh, yeoman, to Miss S. Crookhall, of Saltcoats, Lytham. Deaths. On Wednesday last, at Saltcoats, near Lytham, aged 28, Jane, the wife of Mr. John Ascroft, of Oldham, and daughter of Mr. Cornelius Crookhall, sincerely regretted by a numerous circle of friends. Mr. Cornelius Crookall, farmer, of Saltcoats, is a loser to a considerable amount by the irruption of the sea over the embankment on his land. A great part of his farm was completely covered with water, and produce of various kinds, including five stacks of grain, were irretrievably lost, and about fourteen acres of sown corn were washed away, the loss being quite £300. 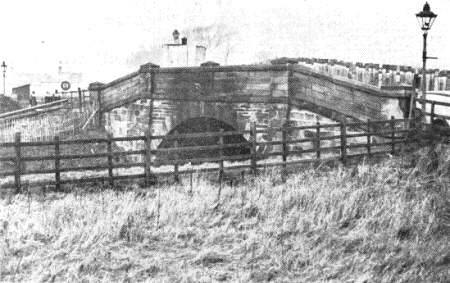 Saltcotes railway bridge during widening in the 1930s.